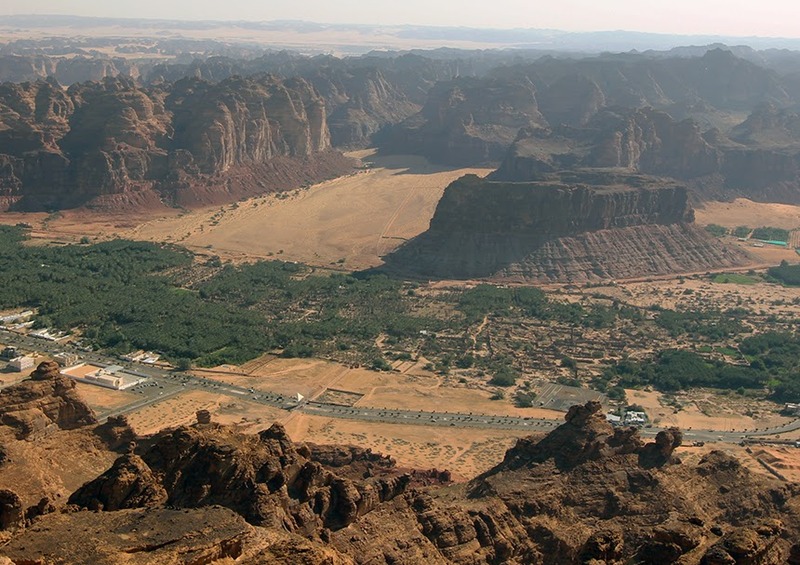 The ancient town of Al-Ula, parts of which are 3000 years old. Our Saudi companions, a young Government Affairs person from KAUST (left) and the wisest, most sophisticated guide I have ever had in my life. Most of the time both had iPads and iPhones in their hands. A Nabatean water tank in Mada'in Saleh. 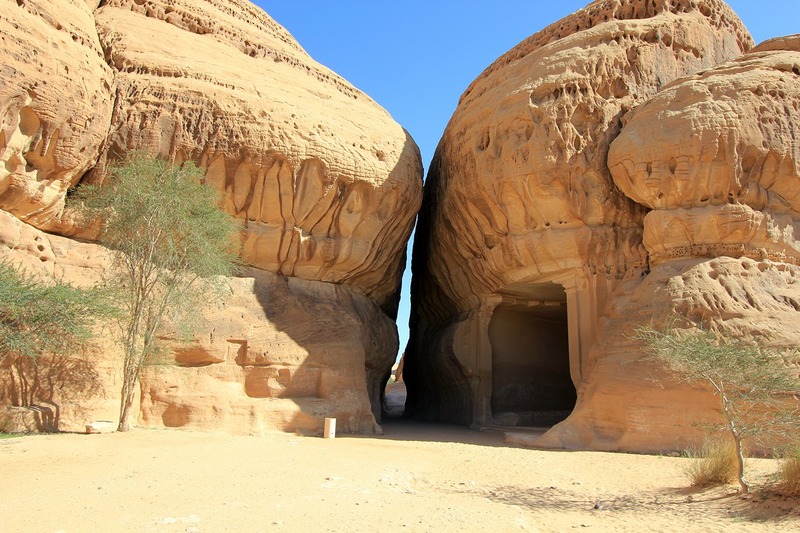 After trading frankincense to Romans for a few centuries, the Nabateans became the wealthiest kingdom in the Middle East. Here was their main town south of Petra. The settlement started 2000-3000 years ago because water flowing from the mountains appeared at the surface and was stored in big excavated cisterns. The 3G network reception was quite good in these beautiful ruins in the middle of nowhere. These network towers came in threes everywhere we drove and kept us connected to the entire world most of the time. When we forgot a book title or a fact in the car, we could check it immediately on Google. Our guide would often show us his pictures on iCloud. I do not recall having nearly such a high-quality reception while traveling in the U.S. Which leads me to this observation: The blissful ignorance and condescension of Westerners is staggering when it comes to Saudi Arabia and technological progress that has been occurring here in real time. The cultural progress is always slower, just as it is in Alabama or Missouri, but it is accelerating too. 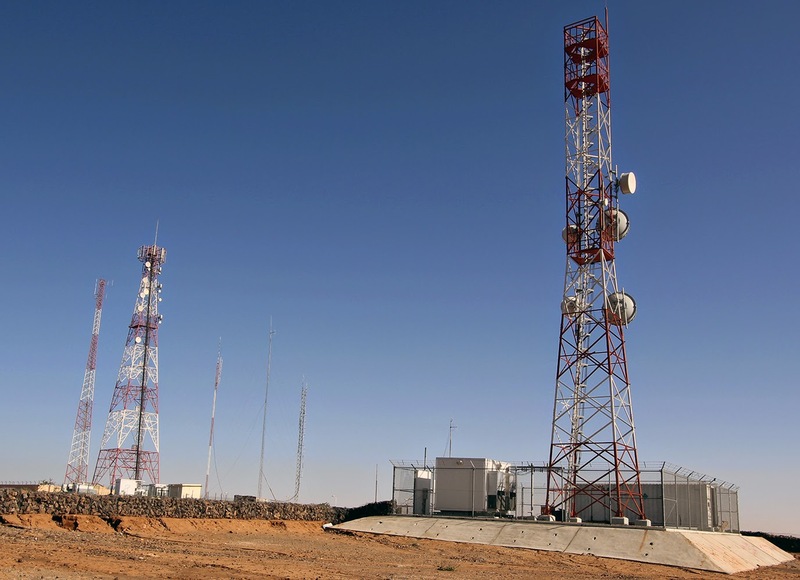 In summary, Saudi Arabia is now fully on a fiber optics network and has been for almost two decades. Technology leapfrogged, and both the internet and telephony are faster and better here than in the U.S. But my fellow Americans have no idea that the obsolete networks and cellular phone systems are now in their country, rather than in what they call "exotic places." Now let's talk about education. In 2008, Saudia Arabia was spending about 5.4% of GDP on education, just like the U.S. Today, a high-ranking Saudi official at a conference in the King Abdullah University of Science and Technology (KAUST), my new university, quoted 25% of the GDP! And it shows. As one drives along Saudi Arabia (NS), there are new schools being built everywhere. There are hundreds of new vocational schools. Families are given cheap loans to build new homes, and these loans are partially forgiven when their children finish, say, a vocational school. Roughly 30-40 thousands of Saudi students are sent abroad each year to polish their English and enroll in American and European universities as undergraduates. These students are in the top 1-2 percent of the Saudi high school graduates and all their expenses are paid. So the Saudi students are supporting some of the financially struggling public colleges in the U.S. These students are now trickling back to Saudi Arabia, and the best of them will enter KAUST, where I will have an opportunity to teach them and do research with them. Sixty percent of the Saudi graduate students at KAUST are women. When I look at many of the remarkable technical managers in Saudi Aramco, with Ph.D. degrees from MIT, Stanford, UT Austin, Texas A&M, etc., I inevitably compare them with their significantly less educated counterparts in the U.S. oil and gas industry. In summary, the fast growing, well-educated working elites are transforming Saudi Arabia in real time. Most Westerners have no inkling about the rate of intellectual change and vibrant business climate around, say, Jeddah, where I live. And these changes occur as parts of the 5, 10, and 20-year coordinated development plans. As one of the remarkable Saudis I met remarked wryly, "We have not survived here in the desert for three thousand years by being impatient." "One f... today equals one f... tomorrow plus one f... each day that will follow - for the rest of my life." OK, so this definition of U.S. capitalism follows the descriptive language of Jon Stewart. Usually, this crisp definition is obfuscated as discounting future at a 10-15 %/year rate to arrive at the net present value (NPV) of all human endeavors. At the higher discount rate, what happens 10 years from today is four times less important than what happens today. Our children need 20 years to grow up and become productive; that's 16 times less important than our pleasures today. "It is time to build policies that reflect our new-found [U.S. oil] abundance, that view the future with optimism, that recognize the power of free markets to drive innovation, and that proceed with the conviction that free trade brings prosperity and progress." "Pull out all the stops and let us plunder today all we possibly [technologically] can. Quickly sell the spoils, tomorrow be damned, and you don't care anyway." I could give you a more technical description of this serious problem, but the understanding of science and engineering is so shallow in the U.S. that I won't even try. Instead, I urge you to read this great interview with Professor Noam Chomsky. Please read it and try to be intellectually honest, able to confront the unpleasant implications of the quotations above, and cease to enjoy watching the "American Sniper," yet another cruel meme of American culture. So sad, Tad, and so true. Our citizens in modern America clamor for free enterprise in the vacuum created by hyper-focused education (not just teaching to the test, but learning only to become consumers) and deliberate ignorance. Just as we refuse to see it was free enterprise in all its unregulated glory that caused not just the Crash of '29, but the one in '08 as well, we, too, fail to recognize that almost every nationally binding creation--from the railroads to the highways to the original telecommunications lines, to utilities--was at the very least government subsidized, or, more often than not, wholly funded and built by our government. Our lagging behind in modern communications is just that most glaring example of who we remain in a previous century for lack of a vision that capitalism just cannot be the guide for all things. Loved the photos, too. Hope to see you soon, my friend. Hello! Thank you for your article. I’d like to try to compare it to my previous experience of learning polish through Skype on online classes for free. I did around 10 conversations over Skype with a native speaker from http://preply.com/en/polish-by-skype. And I was pretty satisfied with their Quality. I think they have a strong teaching quality, following their course curriculum now I can speak polish like a native but i don't need to go any school, but I Want to try another option.